If you're looking for a great industrial dividend stock, these are worth a close look. United Technologies (NYSE: UTX) is struggling to cope with long-term trends that have had a negative impact on its overall business. Military spending is under pressure, and weak commercial construction has reduced demand for elevators and climate control products. The one saving grace for shareholders has been the stock's 2.9% dividend yield, but in today's market, investors can find similar or higher yields from stronger companies. Here are three dividends stocks you should consider before buying United Technologies. While United Technologies' aircraft business struggles with flattish demand, Boeing (NYSE: BA) is set up for a great decade. Its commercial aircraft backlog stood at $426 billion after the most recently reported quarter, and the first 737 MAX airliners are have only recently begun to reach final assembly. United Technologies isn't completely missing out on the market trends that are propelling Boeing, but due to its large commercial building and military exposure, UTX is not benefiting from the same tailwinds. 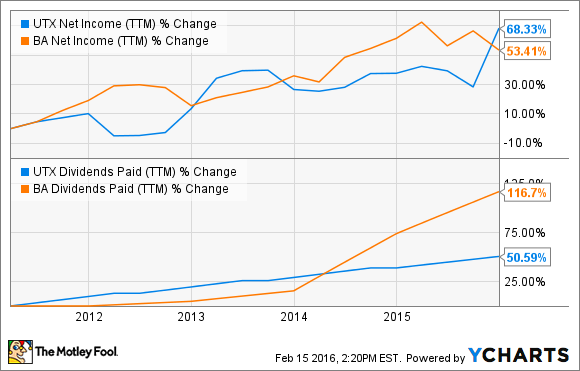 Financially, Boeing has provided a lot more dividend growth over the past five years, and I think that'll continue. The stock now yields 3%, slightly better than United Technologies, and with a strong decade ahead for commercial aircraft demand, I think it will continue to outperform United Technologies. Garbage isn't an exciting business, but it's incredibly steady. And that's what investors are getting with Waste Management (NYSE:WM). In 2014, the company made 54% its revenue from collection of waste and recycling, 18% from landfill services, and 9% each from transfer and recycling. These are businesses where it has the market share lead in the U.S., and businesses for which overall demand will continue to grow. From a dividend standpoint, Waste Management currently has the same 2.9% dividend yield as United Technologies. But when it comes to a business with stability, nothing beats garbage. The General Electric (NYSE:GE) operating today is nothing like the GE that almost collapsed during the financial crisis. CEO Jeff Immelt has returned its focus to industrial operations like building power plants, aircraft engines, transportation, and energy products. In 2015, all of its major segments grew except oil and natural gas, which isn't surprising given the trouble state of those industries. GE is not only more diversified than United Technologies, I think it's better positioned as well. Energy needs are growing, renewable energy is an increasing part of the mix, and energy management is becoming increasingly important as well. Both GE and United Technologies have big commercial aircraft engine businesses, but GE also has wind turbines, power plants, lighting, etc. I'll take those complimentary businesses over commercial building products any day. With a dividend yield of 3.3% and a well-positioned industrial business, I think GE is a much better dividend stock to own than United Technologies. Boeing, Waste Management, and General Electric all have better momentum in their end markets than United Technologies, and they have the equal or better dividend yields. If you're looking for an industrial stock with a dividend, you may want to look at these giants as safer bets in today's market.